Update: Android 6.0.1 has been released. View the changes. Hiroshi Lockheimer, Senior Vice President of Android, announced an update to the Android emoji font on Twitter yesterday showing the Unicorn, Lion, and Crab emojis. Scheduled to hit Nexus phones "next week", here's a first look at what to expect in this update. Above: Five new emojis supported in Google's upcoming emoji update. Approved in mid-2014, emojis from Unicode 7.0 have been adopted by LG, Apple, and Microsoft (in a limited capacity) so far. Above: New emojis found in Google Hangouts and presumably coming to Android next week. 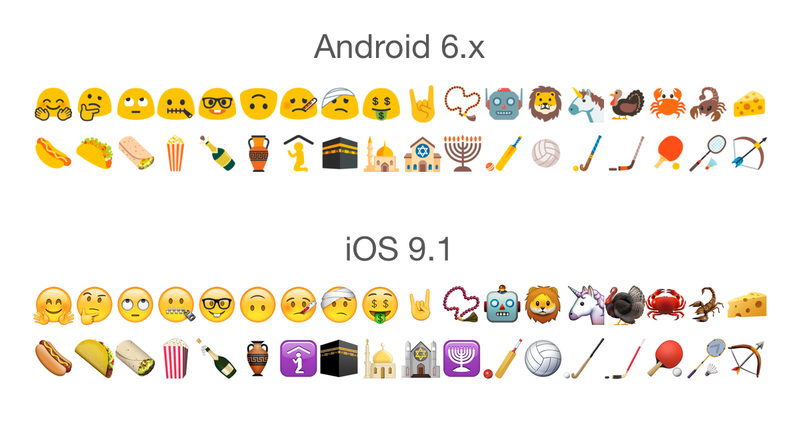 Android 6.x also looks like it will support Unicode 8.0 emojis. In addition to the aforementioned Unicorn, Lion, and Crab, new sports, religious symbols and foods make up Unicode 8. Above: Emojis from Unicode 8.0 on Google and Apple. Support for older Unicode characters such as the peace symbol and alembic look set to be included in this update. Emoji modifiers (for skin tone) and family combinations appear to be absent at this stage. Some existing emoji images have been updated to more closely match Apple's emoji images. I will be taking a closer look at all the emoji changes after the launch this update. Come back for a full changelog of what's new. In the meantime, here is the current list of all emojis supported by Android 5.0 Lollipop.